Having to render any media that does not match the format of the sequence is a problem that has plagued Final Cut Pro versions 1 through 5. With Version 6 (bundled with Final Cut Studio 2, no longer available as a stand-alone application) this problem has gone away. Version 6 of Final Cut Pro introduced the ability to mix video formats on the timeline, a long awaited feature that was the source of lots of teasing from the Avid snobs. The common wisdom used to be to either shoot all of your media in the same format (easily done with a narrative piece, harder with a documentary with many sources, especially when using archive materials) or converting everything to a common format (using something like QuickTime Pro, Compressor, Visual Hub, or Episode Pro) that matched your sequence settings prior to ingest into Final Cut. Otherwise you found yourself with long painful rendering times for all the media in your timeline that did not match the video format sequence setting. This is no longer good advice. In the fast paced world of digital media, common wisdom has a way of rapidly transforming into bad advice. Just this morning I put together a DV-16×9-Anamorphic sequence with source material I shot with a a Canon PowerShot TX1 (720/30p, Photo-JPEG), Sony HVR-Z1U (1080/60i, HDV), and Sony PDW-F350 (1080/60i, XDCAM HD), in addition to DV media (480/60i, DV Anamorphic) that matched the sequence settings. Some formats require good unlimited-RT performance (a faster machine) than others, but on the new generation of Macs mixing media formats on the timeline works quite well. The Photo-JPEG clips showed up with Orange (Unlimited RT playback) along the render bar and while this format might not be played back in real-time without dropping frames, it’s better than having to render to play back. The XDCAM-HD and HDV footage showed up with Green (Real time preview) along the render bar and it played back perfectly without rendering. So you might see some stutter, depending on the format and the system. On my MacBook Pro (2.4GHz Intel Core 2 Duo) all three “foreign” formats played fine on the DV-Anamorphic timeline. Of course, once you introduce effects like a dissolve and a foreign format, you will have to render for full-frame-rate playback, but I was still able to preview (with some stutter) dissolves between the Photo-JPEG and XDCAM-HD footage on the DV timeline. 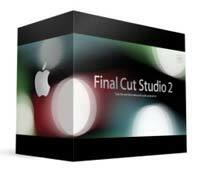 If you’ve not yet upgraded to Final Cut Studio 2, what are you waiting for? The upgrade is well worth the $500 (some vendors sell it for as low as $450) upgrade price. And add to that that Final Cut Studio adds Color to the mix, a professional level color grading application that used to sell for way more than the cost of Final Cut Studio, this upgrade is one of the best values ever to come from Apple. Another new feature of 6 worth looking into for high-end work is ProRes, a high quality format which makes a good choice as a mastering format or common format when mixing various video formats. ProRes is a 4:2:2 component format that does not mungh the color of materials originally shot in component formats the way DV and HDV does. So start mixing media and defy the old wisdom of sticking to a single format. Now that Final Cut Studio 2 has removed the multi-format media editing barriers, you can shoot with whatever digital format you want, shooting each aspect of your project with the camera and format that’s right for that particular shoot, and all your archive and found footage from various sources call all be mixed in with ease. Viva La Difference. Thanks to Josh Snider for asking me the question that led to writing this post. Many of my blog posts originate as my answer to a question posed to me, so I encourage you, dear reader, to send me your questions. Quick newbie question – what books or resources would you recommend for someone who wants to graduate from iMovie 06/08 to Final Cut Pro? I’d like to learn how to use FCP to make/edit music videos, specifically! Christopher, I think the best introduction to editing with Final Cut Pro (as far as books go) is Editing Techniques with Final Cut Pro by Michael Wohl. What I like about this book is not only does it introduce you to editing with Final Cut, but along the way it covers basic editing craft. For just knowing how to drive Final Cut is not enough. Michael Wohl presents the basic concepts and techniques that will help make your editing more successful. How do I burn a video clip to DVD in FCP 6.0? Where can I find easy steps to edit photos and music into a project in FCP 6.0? Rob, You can create simple DVDs with Apple’s iDVD. For more flexibility, I personally use DVD Studio Pro. Importing photos and music into Final Cut Pro is very simple, and is covered in many tutorials, so I will not duplicate the efforts here. For example, you should check out Ken Stone’s excellent Final Cut Pro web site where you will find lots of useful tutorials for doing all sorts of things with FInal Cut Pro and beyond. Good luck! How are you? My dilemna is one shared by many which you seemed to have touched on in this article. I’m doing a pilot doco on people saving underwater creatures called Creature keepers. we are delivering in DVD Pro HD. So of corse the FCP literature(I’m using version 6.0.5) would lead you to believe it will take all formats but there seems to be issues just trying to work with 60i and the DVD pro codec on the same time line. Anyway its a mind f…k currently and as it is conservation project that I’m doing on the cheap and would appreciate any help with a work thru you could supply. I’m trying to get my head around what sequnce setting I should be working in that will make the edit the easiest and then finally if I can get thru the edit phase how I should uprez to delivery without onlining. I’m also haveing some issues capturing the 60i vision out of the camera (Sony HDR FX1)by firewire and keep getting dropped frames which in some clips will capture but in some will give me an error message and will not capture at all. Here are my computer stats. I’ve been told memory is an issue and have ordered another 6GB which will go in tomorrow. OK David I look frwd to your reply and hopefully you may be able to get me out of this mess and one day I could repay the favor by pooring Margaret River Cabernet Sav down your throat. Cheers in advance. Richard, I would also post this kind of question (the more specific the better) on Creative Cow or DVinfo.net, but here are some of my suggestions: (1) when you say you are having “issues” can you describe them more specifically? (2) The simple thing is still, even though FCP can handle multiple media types on the timeline, you might not like what it does with different frame rate conversions. I like to use Episode Pro to convert media to the common format I’m using for a project, simplifies things and reduces render requirements, (3) Capture issues are usually (if it’s not the camera and tape) related to the speed of disks, especially when FCP is the only application running. I capture DV and HDV with no problem to my MacBook Pro internal disk (and it’s 5400RPM) as well as external disks (either FireWire 400, FireWire 800, or SATA via Sonnet Expressbus card). Dropped frames, if your disks are not full and running fast, then there’s a possibility it might be the camera, have you tried capture on a different camera? and (4) for normal editing with Final Cut Pro you don’t need more than 2G, and 4G is plenty. Good luck! David, let me ask a more specific question about mixing footage om FCP 6. How about mixing 1080i and 1080p?